Caydden, 14, and Keston, 11, sit outside a homeless shelter in Boise. They've been searching for housing for three months. “It takes a little bit of a fight, actually,” says Caydden. He has a 90-minute bus ride to get from the homeless shelter where he’s staying to Pathways Middle School. He wakes up at 5:45, quickly brushes his teeth and smoothes some gel in his hair, and then dashes downstairs to catch his school bus. 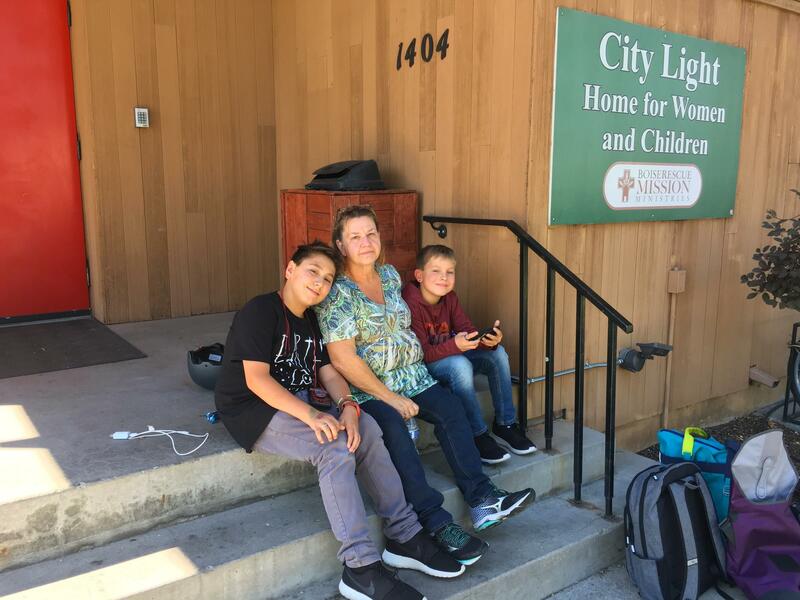 Caydden has been living at City Light Home For Women and Children for a couple of months now with his 11-year-old brother and his grandma, Pam Cantrell. Cantrell says they moved here after getting an eviction notice at their former duplex. “The landlord decided to sell the property, and we just could not find a place we could afford,” says Cantrell. “The more I looked the more depressed I got. I just, I didn’t know what to do." Two-and-a-half million children in the U.S. are currently homeless, and that number is rising as house prices and rental costs continue to grow. Nowhere is that trend more apparent than in Boise, Idaho - the fastest-growing city in the nation. Like Cantrell and her grandsons, many low-income families in Boise struggle to find housing they can afford. Cantrell gets a small disability stipend from the government, but that’s nowhere near enough to cover rent and other expenses. The boys’ mother is addicted to drugs and struggles with mental illness, says Cantrell, which is why she’s their full-time caretaker now. After three months of searching, the shelter became their only option. Cantrell is grateful to have a place to stay, but says not having a permanent home is really hard on her grandsons. It’s difficult for Caydden too, but you wouldn’t always know it. Caydden is a social 14-year-old with a big smile. One of his favorite things about school is seeing his friends. Homeless kids tend to score lower on standardized tests, and have lower graduation rates. It’s harder to concentrate when you’re anxious and worried. And sometimes Caydden does break down with his friends. 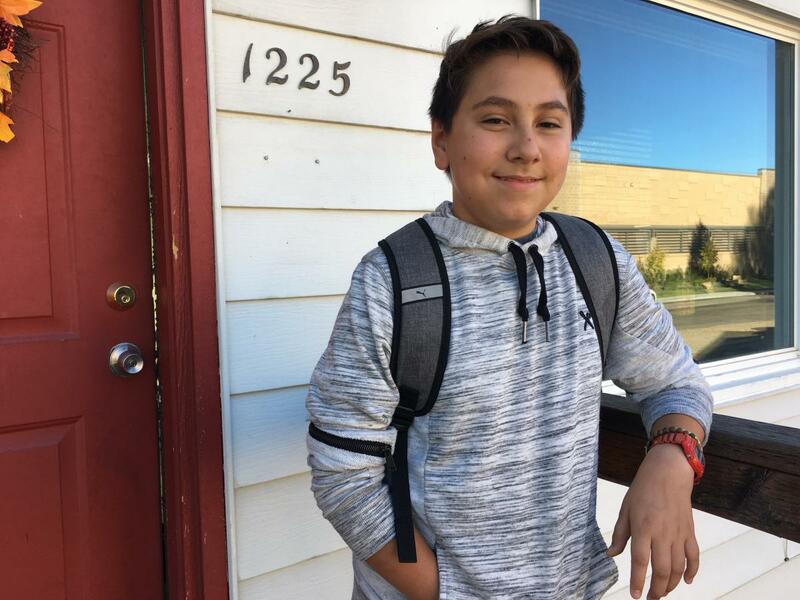 Caydden’s grades have improved since he started at this alternative middle school for students who struggle in traditional academic settings. The school district received a grant to pay for a bus to transport homeless students who are scattered across the Treasure Valley. Homeless students often bounce around to different schools as their living situations change. That can make it nearly impossible to keep up, so Pathways principle Eric Eschen wants to do everything he can to keep tabs on students like Caydden. “He’s a very positive student, very giving, a very good friend,” Eschen says. 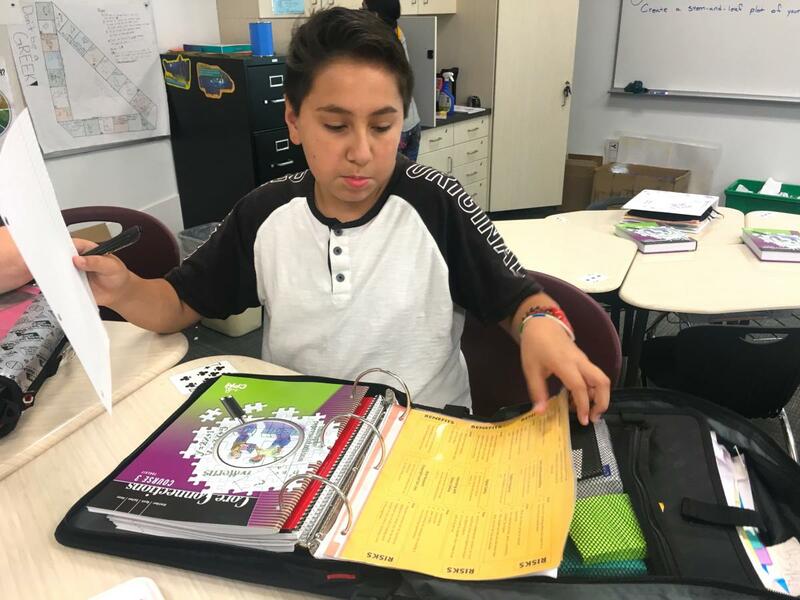 He points to a recent time when Caydden approached him to alert him that another student was making a mess with mustard in the bathroom. He took it as a sign that Caydden cares about the community and the school. For homeless kids, sometimes school can be a place of refuge and consistency in an otherwise hectic and messy world. Eschen keeps an eye Caydden because, like a lot of students in his situation, he struggled with absences last year. “That really affected him and affected his progress, so we’ve got some catch up to do this year," Eschen says. At the end of the school day, it’s another hour-and-a-half bus ride before Caydden meets his grandma on the steps of the homeless shelter. They wait outside for Caydden’s brother to arrive on another bus. Meanwhile, Caydden checks in with Cantrell about the week’s schedule. “Yeah, I probably will,” Cantrell says. She has to keep Caydden apprised of her comings and goings at the shelter so he won’t worry. Caydden has had to grow up faster than your typical 14-year-old. 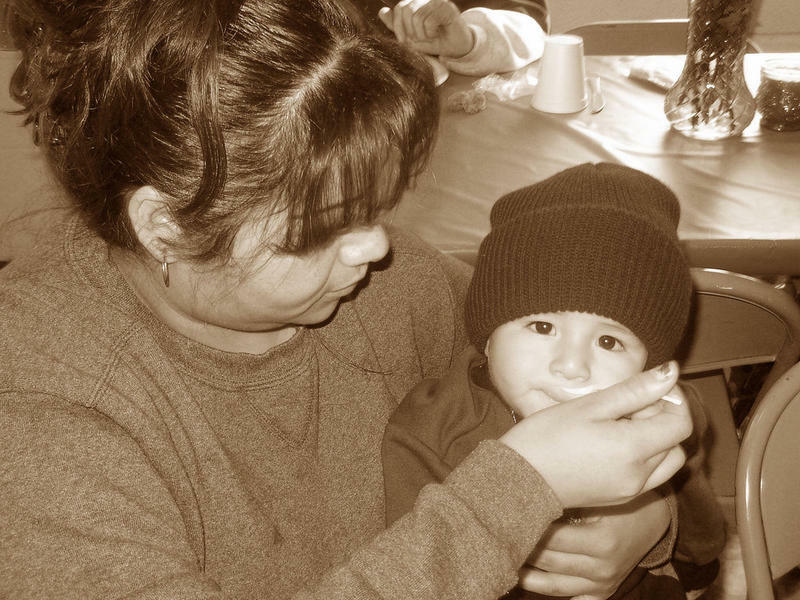 With his dad out of the picture and his mom's drug addiction, he's often had to be resposnbile for his little brother. “Help get him ready for school, I had to make sure mom wasn’t … gone,” Caydden says. Caydden has been trying to convince his grandma that she should let him get a job so he can help with rent. He’d like to earn money at a fast food restaurant, or, at the least, raking leaves and shoveling snow. But Cantrell, aware that her grandson has already been through more than most teenagers should have to grapple with, won’t have it. A few weeks later, there’s good news in Caydden’s world—they got a house. It’s about 700 square feet that they share with another woman from the shelter. Caydden sleeps in the basement, in a tiny room with concrete walls and a small window. Cantrell and Keston sleep on inflatable mattresses in the living room. “It’s not the greatest, but it’s not the worst,” says Cantrell. She’s been working on sprucing up the place—scraping gum off the hardwood floors that was left by the last tenants. She plans to brighten up the living room with fresh paint. But for Caydden, it’s a huge improvement. “I feel much more comfortable, and safe,” he says. 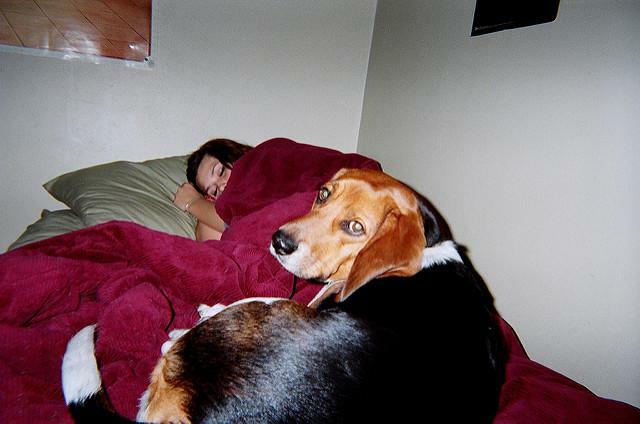 He loves that the house is near Boise State University and has a weed-filled back yard that backs up to an alley. On football game days, he figured out that he can sell parking spots in the yard to game-goers. “Last weekend we made 90 bucks!” Caydden says. He’s scheming about trying to sell sodas on game day, too. “This is home!” he says, smiling. Sometimes they're on the streets. Sometimes they live out of a car. As of Dec. 15, Billings School District 2 identified 385 homeless youth. They are the kids Operation Billings Child aim to serve.